I thought IÂd take time to do a pictorial guide on hand pollination of squash. When I first wanted to hand pollinate, back in 1984, I remember frantically trying to get information and not knowing exactly where to turn. I had just joined the Seed Savers Exchange and heard about hand pollination but didnÂt know how to do it. I remember calling a couple of SSE members. Everyone was very helpful. But I had a difficult time picturing what I was told. Imagine how pleased I was when I received an SSE publication with full illustration of hand pollination! That first year I didnÂt manage a successful hand pollination. But once I saw this technique illustrated I never had a problem. HereÂs some help for anyone else who might be wondering how to do it. I always go out the afternoon beforehand and tape shut the flowers due to open the following morning. The main challenge with this is to recognize those flowers, as a prematurely taped flower will simply abort. The general rule I follow is that I can tape flowers after 2:30 PM up until dark. Most varieties "yellow up" the day before. A few varieties hardly "yellow up" until the night before. But once I get to know a variety it isn't difficult to recognize the ones I need to tape shut. Notice in the above picture that there are both mature male and a female blossoms as well as some immature blossoms of both sexes. If you accidentally tape a flower not ready to open, just remove the tape in the morning. It will probably be okay. This is great stuff, thanks. One question - I'd read, some time ago, that to best preserve a squash species that several 'crosses' between plants of the same species was the way to go - ie pollen from one plant fertilizing another plant, with some recommended number of plants being a minimum, and the more, the merrier. Do you have any /thoughts comments on that? David, when you say "species," do you really mean to say "variety/" For example, "Green Hubbard" is a variety. The species for "Green Hubbard" is c. maxima. "Pink Banana Squash" is another variety which also belongs to the c. maxima species. These two, being of the same species, can cross. Until you say otherwise I'll assume you were referring to "variety." I've heard some people say that one should use pollen from a number of different plants and try to save seed from a number of different fruit, in order to maintain vitality. But I don't really believe it. I have hand pollinated, male to female flowers on the same vine for over a decade before, and found no ill effects on the resulting offspring. Now, to maintain genetic DIVERSITY, that's another thing. Inbreeding will greatly narrow the variability within a given strain. So there is some benefit in doing as you say. But it is not absolutely necessary. Sorry, George, my bad - I did mean 'variety', not species. So the article I was reading was talking about 'diversity' within a variety, maintaining the viability of the strain. Anyway, thats good to know that you can work with a single vine and get consistent results. My interest is more in growing my own seed, not so much for sale, so even if I blow it, I can always go buy some more sometime. I think maintaining a variety is a bit more complex than we often realize, an example would be the numerous strains of the variety 'Brandywine' tomato. I ran across this re Chili: "....Paul Bosland, professor of horticulture and director of the Chile Pepper Institute, said researchers created the new varieties because the old Jim Big and 6-4 varieties had "run out," losing their signature flavor after many growing seasons. My guess is that Big Jim ran out because there had been some crossing, over the years, and selection had only been done on the basis of appearance, not flavor. Commercial growers, even seed producers, probably don't often think to taste fruit from plants used for seed saving. This is excellent, thanks so much for taking the time to write this out. As said before, not many people have taken the time to post pictures and such online. I do have a few questions, however. What is meant when you say "mature pollen"? Does this mean the pollen from the flowers as soon as it opens? Why is it important to hand pollinate theses flowers at a certain time in the day? Lastly, when you cross-pollinate flower pollen from different species, will it effect the taste/color/form of the fruit? Nathan, pollen matures in the flower. If one uses a male flower for a pollen source, and it is even a couple of hours too early, it is possible that the pollen won't be ready. This is usually quite notable, as it simply won't be powdery. It will appear that there is none. Squash and pumpkin pollen is ready when the sun comes up. I'm not sure how long it last in the heat of the day. But my impression is that hand pollenations after noon are unlikely to function. This is why it is important to hand pollinate at a certain time of day. If you hand pollinate between species, generally speaking, the seed will either not form, or else it will be sterile. There are a couple of exceptions to this rule. But I'm not current on what they are. Crosses between varieties (different kinds of squash, but of the same species) absolutely has no effect on the quality of the fruit. That is completely a matter of the genetics of the female parent. It is commonly held that there are four main squash species. c. pepo - includes: Jack O Lantern type pumpkins, zucchini, delectica, acorn & some small ornamental gourds. c. maxima - includes: Turk's Turban, Hubbard, most of the giant pumpkins like Atlantic Giant, Buttercup and many others. c. argyosperma (formerly known as c. mixta) - includes most of the cushaws. 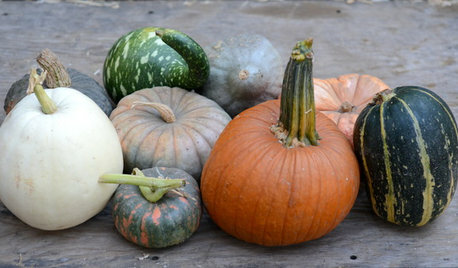 c. moschata - (my favorite) includes: all of the butternuts, Tahitian Melon squashes, Choctaw & Seminole pumpkins and a number of high quality Japanese squash. I have never seen a argyosperma/moschata cross. But I've heard of it. I believe I've heard of a maxima/moschata cross, which was sterile. Other crosses may be possible, but generally they have to be artificially induced. 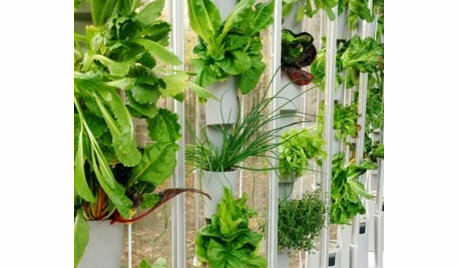 In application, this means that if I only grow one of these species, and I don't have any neighbors, closer than 1/4 mile, growing squash, then I don't have to hand pollinate. I'll have pure seed! This has always worked for me. But hand pollination is a safe way to be sure. If I lived in the suburbs, I'd probably always hand pollinate to avoid problems. What a useful thread this is. Perhaps I should practice hand-pollinating my summer squash so I'll be good at it when the time comes to pollinate my Watauga Pie Pumpkins? So just to clarify... I'm in a pumpkin growing contest with some friends in northern Michigan. We all have Big Max pumpkins and the flowers are starting to open. Our growing season isn't the longest and we will probably end up with many pumpkins that are still growing when it's time for the "weigh-in" in late October, but we'll have fun growing them anyway. So in our case, taping after hand-pollinating isn't required because we're only interested in the fruit and not the seeds? And cross-pollination with the other varieties of pumpkins in our garden will not affect the size potential of the Big Max? Thank you. And any advice or links for growing big pumpkins would be appreciated. I'm planning on winning this contest! You are correct Jarvinen, hand pollination is only necessary to produce pure seed. Crossing with other varieties has no affect, whatsoever, on the size or quality of the fruit which a given plant produces. The difference would only show up if you planted the crossed seed. Very useful and informative, for those who want to grow their own seeds. I am not that organized. Except for cucumbers. This year I had 3 different varieties next to each other and I have let one good cuke to mature for seeds. Now I am thinking what if it is cross-polinated? I will plant some of its seed for the second round and will find out the answer. But I do hand pollinate my night-flowering gourds such as bottle gourds. These gourds, with white flowers open after sun goes down and stay open till dawn. 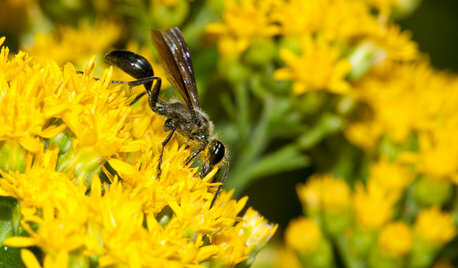 Bwcause there aren't many insects that time to pollinate them, one has to do it himself. Otherwise you may not get any gourds. Also because of this, you will not get any cross-polinations and no need for taping, since you are the only INSECT (lol, intelligent one though). This past june I went out of town for 2 weeks and when I came back there was no single addition to the number of my bottle gourds but the ornamentals had produced many. Your cucumber seed will certainly be crossed. But it will be crossed only with cucumbers, unless, perhaps you are growing an Armenian cucumber, in which case, it wouldn't cross with other cucumbers, but rather with cantaloupes. Very interesting about your lack of night time pollinators: here in Tahlequah, we have an abundance of them! Yes, though I doubt you could get enough rain to deter the bees. More likely, you have a shortage of pollinators. 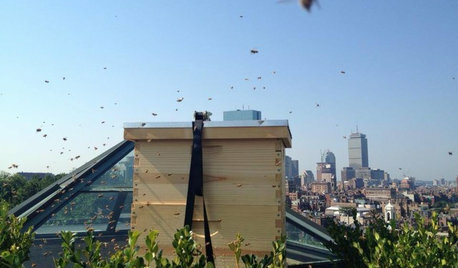 Your area of the country was very hard hit by a number of honey bee plagues, starting in the 90s. Then, on top of it, I know that some townships spray for gypsy moth, and... don't seem to care about bees and bee keepers. Also, you have had exceptionally cool weather this year. 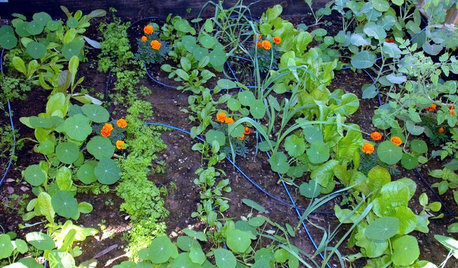 Most likely your plants are just slow to getting around to produce. I bet they will shape up very soon. Actually, all the photos, except the one specifically labeled are of Scarchuks Supreme, which is a variety of acorn squash. Here's a link to a post I did on Warsaw Round. You are blessed not to have those pests! Wow! 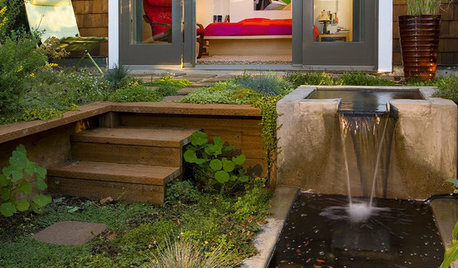 Without pests I can imagine how one of your plants might engulf the neighborhood! Thank you for this great pictorial demo of how to save pure squash seeds, George. Whenever the question crops up, I send people to this page. Everybody seems to understand it so easily. There are a few variations that apply here in cool climate England. Because we don't get the hot temperatures, it is not quite so critical when I hand pollinate. I generally do it sometime in the morning, but afternoon works too. Moschata squashes are the most difficult to get right here and I pollinate (with suitable, different male flowers) two days in a row. I find that slightly older pollen still works, if the difference is only a day in maturity of male and female. As I said, this is because our climate is cool and plant development is so much slower as a consequence. But it probably also applies to northern US and Canadian gardeners. This year we had to go away for a few days and I had a squash with matched male and female flowers, but both would have been ready when we were away. Both were already large buds, but not a trace of yellow yet. They would have opened on our first day away. Rather than lose the opportunity, I picked the male, stripped the petals, and placed it over the pistil inside the female flower, then tied it in place, so that developing pollen would fall into the right place. I was lucky and it worked just fine with a nicely bulging fruit on our return. It is worth a try if others reading this are in the same situation. And I would like to add a note of caution: I sent some of my handpollinated c maxima seeds to a friend and she had a crossed plant amongst the pure-breeding plants. I was a bit upset, because I had gone through the handpollinating process with care and I have been doing it successfully for years. My friend sent me photos and I could detect typical characteristics from another c maxima I was growing (and handpollinating) the same year. It is very likely that I handpollinated both maximas on the same day, in fact. That set me thinking - it is possible that a pollen grain or two was still lodged on my fingers when I pollinated the second maxima squash, which gave my friend a rogue plant. Now I wash my hands between pollinating two squashes of the same species to prevent that from happening again. The methods of tying up the flowers differ from gardener to gardener. Anything from blossom bags, tape, garden string, rubber bands to clothes pegs. I use string or clothes pegs here. Clothes pegs are nice because they are easier to spot, but only appropriate for strong stemmed flowers. Thank you again for taking the time for this excellent post. You make a most important point about the difference in climate. Years ago we lived in a high cool rain forest environment, in a town called Tlatlauquitepec, Puebla, Mexico. I imagine that there were some similarities between the climate there and where you live. C. moschatas had to be coaxed along, and were not grown by the locals. The native squash, was called Calabaza Castilla (like so many others in Mexico) but it was a c. pepo, and exhibited tremendous vitality and resistance to extremes in humidity and coolness. Also, the method for closing flower petals would be affected by humidity and temperature. In your climate, I suppose the petals don't dry down so quickly. Here they wilt by the afternoon and often develop holes, even in my taped flowers. I go back in the evening to inspect the taped flowers, and if they have developed a hole, I remove the tape and treat it as a crossed fruit. I had a particularly bad year in 2006, which was the first year for me to hand pollinate in this climate. I'm not sure, exactly, what went wrong. Though now, I often tape the flowers shut with several lengths of tape, essentially re-building the flower where it might break open. Additionally, I've adopted the philosophy "If it isn't RIGHT, it's WRONG." In other words, if in doubt, treat it as crossed. Thanks for your input. This is important for those who live in different climates. This is my first garden in this area and I am having trouble with my squashes not growing more than two inches long. You described exactly what was happening so I guess they are not getting pollinated. I haven't noticed any bees in my garden (somewhat of a good thing with my bee-phobia:) which explains everything. 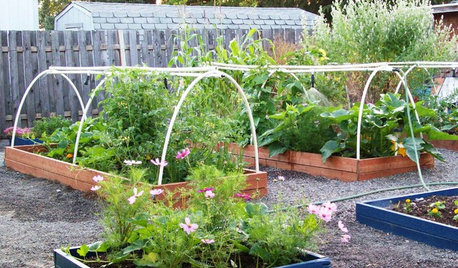 I've got several different vegetables growing so will I need to hand pollinate EVERYTHING? Thank you so much for your information. It has been a huge help! I don't know where you live and garden. But I doubt that you lack all pollinators. 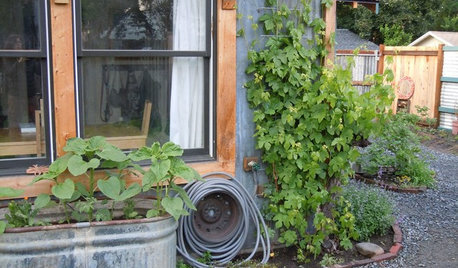 At any rate tomatoes,peppers, beans and other legumes are pretty much self pollinating. All they really need is a slight breeze to move the plants. Moths, flies and other insects can pollinate some crops. The ones you might need to hand pollinate would be things like squash, melons, cucumbers and gourds. Well, here's a link to a Google search on Mason bees. Perhaps you can make a home for them, or even, purchase some. I do know that buckwheat would attract many insects. Thank you so much for the vast information you're sharing. I feel lucky to have found the post by chance. If the info you shared is included in FAQ section of the forum, if there is one, it will greatly help others to locate it in the future. Would this same information hold true for watermelons? Penny, I have no idea how to get something into the FAQs. The only time I tried to communicate with someone who actually "runs" GW, I was unsuccessful. Dale, I believe that this info is indeed, essentially applicable to watermelon. However: 1)Watermelon flowers are smaller and therefore a bit more challenging to work with, and 2) I believe that watermelon pollen matures somewhat later in the morning than that of squash. You would have to experiment with timing until you found that the pollen was fluffy and ready for use. Maybe someone will drop in who has actual experience doing watermelon hand pollinations. What if my winter squash (kabocha) is aborting before the fruit is 1" and the female flower never gets a chance to grow or get close to yellow/orange? Only 1 fruit set early in the season, after that, all new fruit was aborted before they got close to the flowers opening- i mean they were very green when aborted. It's been hotter than usual- in the 90's for at least 2 weeks and I've read that could be an issue. I'm just hoping there's something I can do. We have plenty of bees and male flowers. I also have bacterial wilt from that damn cucumber beetle. Maybe that's it. My guess is that either the heat is the cause, in which case the plant will likely set fruit when temps begin to cool down, or else for some reason the plant is too weak to support more fruit. Wish I could help more. Hi, I just stumbled upon this thread (and this forum) even though I have been on this website daily for the last couple years learning new things. Thank you for this great description on pollination. My question is, how do you know if you have enough pollen on the pistil? I am not sure when enough is enough. Does it have to be completely covered in pollen? Just reading up for 2012 season already. Glad you found this thread. I only just noticed that you had posted. Thanks for a great post that was posted a little while back but is still, and, may be even more relevant now days after the latest (attempted) exploits of monsanto here in Europe. So you're saying from a seed saving perspective, that if I pollinate and keep seeds from the same genus/species, I am still keeping the variety pure...??? So, as long as the two or three or four varieties I grow on my land are either C.Maxima or C.pepo or C.Agyrosperma / mixta or C. Moschata then I am not actually cross breeding... So that means I only need to worry about bees/bugs from outside of place tainting the purity? I would still use the tape or pegs to ensure we are pure. Also did I understand it right that if I allow & even facilitate a cross variety pollination I might actually be helping to keep the variety more vital?? Ironically one of the varieties I want to plant to grow seed for seed saving and for harvest too is the Pink Banana Squash. Likewise if I want to save an heirloom variety or two or three I just need to choose ones from the same species in that growing year, to keep them a pure seed for seed bank saving purposes. All my seed saving books are still in Australia. We are heading back in October this year but i am researching what I will grow for the first two years on our return to develop my seed bank again. Is there a book you know of that lists all the varieties / species of pumpkins/squash? Your post is quite extensive. If I didn't catch something in my response, feel free to let me know. If you have the necessary isolation distance, that neighbors' plantings won't contaminate your crop, and if you plant only one variety of each species, then, generally, you can count on your seed being pure. I have heard of a rare interspecies cross (c. moschata to c. maxima, if I recall). But if there is adequate pollen for a given species, it will normally not cross with another. If there is any doubt, then simply hand pollinate. I try to get pollen from a couple of donor plants, just to keep the genetics a bit broader, within the variety. But that is probably not necessary, just a nice thing to do. Within a given species there can be many varieties. Varieties freely cross. Species do not. So, if you want to keep a variety pure, then you need to isolate it from other varieties of the same species, or...hand pollinate. Crossing varieties might give you hybrid vigor, and, if you just want to keep those genes around, you could cross varieties. The genes will still be there, just jumbled up. But keep in mind, it takes a good sized population to maintain those genes in a crossed (some call this "landrace") situation. Also, if you should want to regain one of those original varieties, from out of such a seed pool, you might spend many years selecting for it. It is probably easier to simply keep the varieties pure and maintain them. Here are some on-line resources for you. They list species and give guidance for seed saving. The Adaptive Seeds Guide looks excellent, though I have not read it from cover to cover What a great service to publish this for free! Sandhill Preservation Center lists species with variety. Baker Creek Heirloom Seeds also lists variety with species. Here are two books which could be helpful. Depp's book, though dealing with plant breeding, gives much good info which is useful for seed saving. Another related question... This year I am having many female flowers come up first, so I don't have much pollen available. Is it possible to pollinate C. Maxima with C. Pepo pollen? I dont care about saving seeds but was wonder if that would produce fruit? It probably won't. 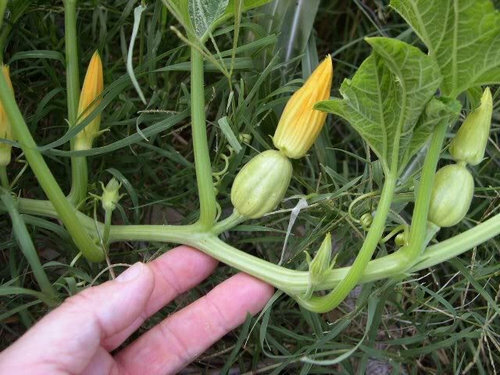 However, your squash plants should produce male flowers pretty soon. I can't recall why, but it appears that environmental factors sometime cause the plants to produce all female flowers for a while. The norm, in my experience, is just the reverse. I've been hand pollinating my butternut squash and jack-o-lantern pumpkin for years, but this year I have loads of ready females and in the last few days males to but with what seems to be no pollen on them. I've called the numbers on the seed packs but no one seems to be that knowledgible at these seed places. I'm wondering if it has to do with all the wet cloudy weather we've been having. The males are mostly facing skyward on stems in the middle of the plants, Are they getting so drenched with rain that by the time they open the pollen is washed away or too wet and sticky to be useful? Last night was dry and today was sunny, but the one male that opened had very little pasty yellow pollen. So I'm wondering if there is a way to keep the males dry to see if that makes a difference, because more rain is coming. No pollen... are you sure? The grains are microscopic, but even so you should be able so see them as a fine powder. Perhaps bees are busy doing their jobs and have scraped all the pollen away before you arrive. If so, more than likely they have spread it to the female flowers. If you are totally curious, you can bag up one of the male flowers with a sandwich bag and a twistie to exclude any bees, then check it out for yourself. Oddly enough, there are a few reports, myself included, of Butternuts setting fine fruits in the complete absence of male flowers. Are your female flowers setting fruits? May I ask a question? This is my first year of hand pollinating, and have noticed an increase in yield in my garden using male flowers loaded with pollen in late spring. 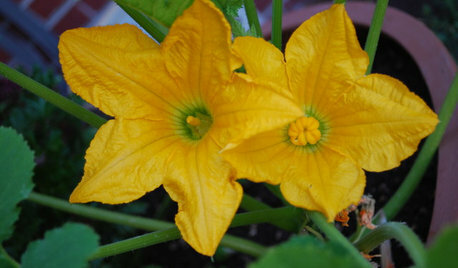 It is almost August 1st here in zone 7a and when I go out to hand pollinate my butternut squash all the male flowers have already been robbed of their pollen by the hungry bees and insects. The male organ is there but no pollen on it. Can I then find a zucchini male flower and use its pollen? Must the pollen be from the same type plant, or is pollen crossable between different plants? I have had some success and some aborts but I can't tell if it is truly success or if the bees beat me to the flower with the proper pollen, or is my thinking incorrect? My comment just above your post seems appropriate. But no, you can't pollinate a Butternut with a zucchini blossom. Too bad. And sometimes individual plants do have flower deformations such as failing to produce pollen. It can be annoying. Pollen has to be from squash of the same species. Zucchini is from the c. pepo family and Butternut is a c. moschata. So tcstoehr is correct. However, it sounds like you have an active population of pollinators and that they are simply beating you to the draw, so to speak. You probably don't need to do anything at all, except let nature run its course. Yes the female flowers have set fruits these last couple cooler dry days. Just before that I had several male flowers, which have now dropped, so when the female arrived I only had one or two males which had been stripped clean by the time I got to it, thus the plant aborted the fruit. We has just gone through a hot day/night period with lots of rain, here just outside Fredericksburg, VA. It seems like either the bees, or cucumber beetles got to it first. I try to stay organic and had not heard about Neem Oil to control the cucumber beetles, so.... maybe next year? I have another female getting ready to bloom, I think I will bag out a couple males and the female and see what happens, I hope clear sandwich bags work. Sounds like Macmex's suggestion might be the way to go, although he tapes the flowers closed. His pictures are sure a great help, I will also tape some like he shows. Thanks, only tape then, just taped off a male, like in your photo, have a female that should flower tomorrow or next day. By the way, I was shopping today with my wife, and saw a young man with shirt that read, "Failures are just Learning Experiences". I thought whoever wrote that must be a gardener. 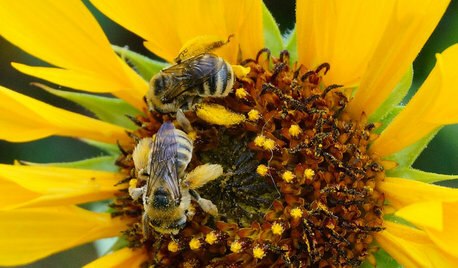 The male flowers may be "stripped of pollen" but that pollen is not all on the bees' pollen packs; it's also all over their body. When that bee goes to a female flower for nectar, they walk all over the stigma. This will happen many, many times in the few hours that the flowers are open, so you are almost certainly getting pollination. Hi macmex, I'm creating an information sheet on this topic for our community seed bank in Creston, BC. Would you mind if I used your photos? They are fantastic! Jeff, go ahead. Just give credit for the source (me). My Internet is down right now, and I'm only using a temporary fix, late at night. Will try to communicate more soon. Desperately need help choosing wall colors for open floor plan home with vaulted ceilings! Bug Spraying in your Area? POLL: What are you planning to grow this summer? What's chewing my pumpkin blossoms overnight, insect or animal?